February | 2011 | Carla Cassidy Books - Don't Turn Out The Lights! It’s here! The last of the Lawmen of Black Rock series! 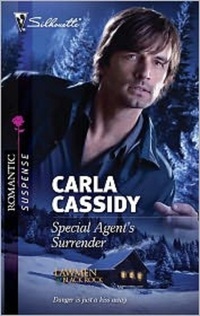 Special Agent’s Surrender is on sale now and I love this hero! I love this cover! Is this guy hot, or what?! And now a confession – I’m hooked on American Idol this season. I haven’t watched much of it the last couple of seasons, but this time there seems to be so much amazing talent! It’s an indulgence I’m giving to myself, one that I normally don’t because I discovered long ago that I can’t work to music. I do my best work while watching television. The better the show, the better my writing goes, but music screws me up. I think maybe part of it is because as a senstive writer type (okay, quit laughing) music speaks to something deep inside me and I find it pulls emotion that is often inappropriate for what I’m writing, so it’s a no-no. Then there’s the problem that I am an entertainer at heart and I want to sing with every song that I know the words to. I also can’t fall asleep at night listening to music for the same reason. I either want to get up and belt out the tune or dance in the middle of the bed. Back to the writing life, I’m working up a synopsis for a new series and hope to get it sent off by the first of next week. It’s cowboys and danger and love…what could be better?